This year over 100 volunteers and supporters from more than 27 businesses and community organisations, attended the annual Golden Moments awards in Aviva’s boardroom. The evening was compered by Stuart Page, Pro Vice Chancellor (Development), York St John University and York Cares board member, awards were presented by Joe Micheli, Head of Commissioning (Early Intervention, Prevention & Community Development), City of York Council, and BBC Radio York presenter Elly Fiorentini interviewed award winners to find out more about what they had been up to. The York Cares Golden Moments Awards recognise the impact employee volunteers have in the city and give us a chance to say thank you to everyone who gives their time through employee volunteering to make York a better place. 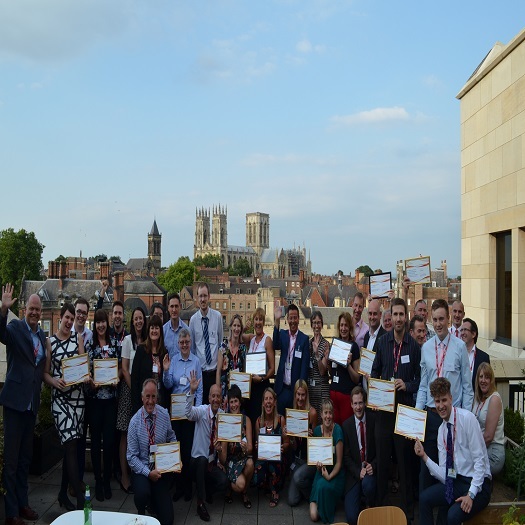 Ten Golden Moments awards and eight Golden Moments of the Year awards went to volunteers who had taken part in a range of activities across the whole York Cares programme. It was a fantastic evening with so many heatwarming stories about the impact that employee volunteering has had both on the employees who have taken part and also on the organisations they have worked with. We want to say another huge thank you to everyone who has been involved over the last year and here’s to the next!